A new Russian rocket designed as a successor to the workhorse Proton booster lifted off Tuesday on a maiden test flight that could signify Russia’s shift away from launching satellites at the Baikonur Cosmodrome in Kazakhstan. The 180-foot-tall Angara 5 rocket ignited five kerosene-fueled RD-191 booster engines and lifted off from the Plesetsk Cosmodrome — a military-run spaceport 500 miles north of Moscow — at 0557 GMT (12:57 a.m. EST) Tuesday, according to the Russian Federal Space Agency. The RIA Novosti news agency reported the Angara 5 rocket’s lower stages — comprising the new technologies to be tested on Tuesday’s flight — performed as designed and released a Breeze M upper stage 12 minute after liftoff to begin a series of engine firings to put a dummy satellite into geostationary orbit 22,300 miles over the equator. The Russian Ministry of Defence confirmed the Angara booster worked as expected before deploying the Breeze M stage 12 minutes after liftoff. Russian President Vladimir Putin watched the launch via video conference, RIA Novosti reported. The launch was not broadcast live to the public. 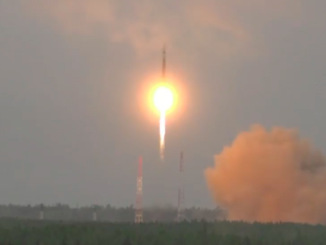 The rocket’s Breeze M upper stage reached geostationary orbit about nine hours after liftoff, according to an update posted on the defense ministry’s website. Russian officials declared the launch a success. “This is a major achievement for our space rocket industry and for Russia in general,” Putin said in remarks after viewing the launch. Tuesday’s test flight comes after a smaller version of the Angara rocket launched in July on the program’s first demonstration mission. “We are consistently implementing a large-scale state program … a program that actually starts a new stage in space exploration,” Putin said. “It means that Russia now has a modern and environmentally friendly launch vehicle of a heavy-weight-class,” said Oleg Ostapenko, head of Roscosmos, the Russian space agency. The rocket’s kerosene-fueled RD-191 engines, made by NPO Energomash of Khimki, Russia, generated roughly 2 million pounds of thrust at maximum throttle to drive the launcher into the sky. Engineers derived the single-chamber RD-191 engine from the four-nozzle RD-171 and dual-chamber RD-180 engines flying on the Zenit and Atlas 5 launchers. The five engines were supposed to fire in unison for more than three minutes, when four of the outboard boosters were expected to shut down and fall away from the launcher. The core RD-191 engine — operated at a partial thrust throttle setting in the first phase of the flight — was programmed to ramp up to full power and continue burning until it consumed all of its kerosene and liquid oxygen propellant supply. The animation below — released by the Russian Ministry of Defence — illustrates the Angara 5 rocket’s initial launch sequence. A second stage RD-0124A engine and a Breeze M upper stage — borrowed from Russia’s Soyuz 2-1b and Proton rockets — were to finish the job. The Angara 5’s five-meter (16-foot) diameter payload shroud was also armed to jettison once the rocket flew out of the dense lower layers of the atmosphere. The flight’s Breeze M main engine was expected to ignite four times over several hours to reach the mission’s targeted orbit. Russia’s Itar-Tass news agency reported the test launch was aiming for a geostationary orbit 22,300 miles over the equator. The end of the test flight was scheduled for 1457 GMT (9:57 a.m. EST) with a simulated separation of the mock-up payload, according to RIA Novosti. Such orbits are commonly used by military and commercial communications satellites. 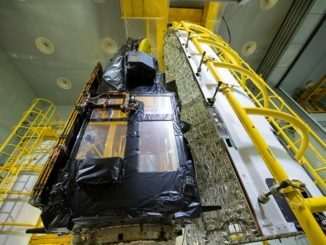 There was no separation of the dummy satellite — as designed — and the Breeze M stage conducted two more maneuvers to transfer to a “graveyard” orbit away from operational satellite traffic, according a press release from Khrunichev State Research and Production Space Center, the Angara program’s prime contractor. The simulated satellite weighed about 2,040 kilograms — about 4,500 pounds — according to Khrunichev. 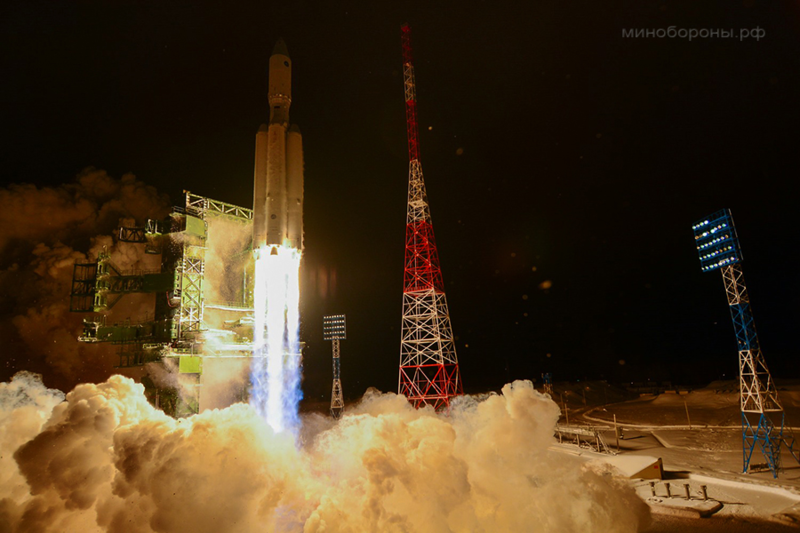 A successful maiden launch of the Angara 5 rocket Tuesday would spell the beginning of the end of Russia’s use of the Proton rocket, a launcher that has been in service since 1965 putting heavy Russian military and commercial satellites in orbit. Russia has no plans for the immediate retirement of the Proton rocket, but officials have said they are eager to shift away from using the launcher, which has run into reliability woes and burns toxic propellant. Russian officials plan a series of Angara test flights before the rocket family is operational by 2020. 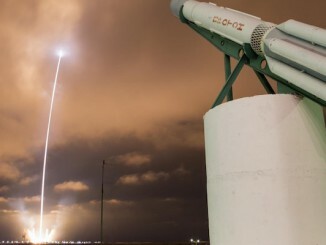 The Angara rocket’s entry into service would also help Russia’s space program move away from the Baikonur Cosmodrome in Kazakhstan, the historic base in Central Asia where the first artificial satellite and first crewman launched into orbit. The Angara 5 is Russia’s most capable new launch vehicle in a generation, and its first test flight is the culmination of a 22-year development effort that cost approximately $2.9 billion, Itar-Tass reported. The Angara rocket family comes in several models to lift light, medium-class and heavy satellites into space.